This is... wow... I really like this figure. Much as DC Direct's previous Bizarro figure is my overall favorite Bizarro figure, this figure is pretty much my favorite interpretation of Bizarro. What I mean by this is that it is not intended to be the Bizarro, and therefore it can't really be viewed and critiqued as such. It is based on the ingenious art of master painter Alex Ross and his current bi-monthly maxi-series Justice. The book, co-orchestrated between Ross and Jim Krueger, is roughly a "realistic" approach to DC villains working together to attain power through subversive techniques. It's actually proven to be quite a good read so far (we're only at issue #4 as I write this) and of course Ross' art remains unequivocally great. In terms of the design for the characters, Ross sticks to what he does best for the heroes: Silver Age costumes. He does take some mild license with the classic designs but they are, for all intents and purposes, not different from Ross' previous books with the characters. For the villains, however, Ross pretty much redesigns everyone, for better or worse. Brainiac trounces about in white surgeon's lab coat (it actually looks really awesome), Cheetah wears the skins of her pet cheetahs she herself skinned, the Riddler sports a cool trench coat with glowing light emitting from its openings and Bizarro looks like a zombie! I'm a big fan of Bizarro sporting a purplish color scheme and "bizarre" and monstrous proportions but this interpretation has neither of those. In their steadm he essentially offers, at least to me, the best conceptualization of what Bizarro essentially is – a failed clone of Superman by Lex Luthor. He has essentially identical proportions to the man of steel, but his skin is cracked and gray. The notion that this conjures up for me is that this Bizarro is sort of the classic example of science fictions' "rushed clone." See, technically, a clone can't be created at full maturity – it must age naturally. Being a comic, and all that that entails, I can accept the fact that Lex has "full-term" technology but either a) it's still not perfect, resulting in the imperfection that is Bizarro or b) even he was "forced" to rush the clone out too early, before it was finished, and that is why Bizarro is basically "not done yet" (anyone see the Judge Dredd movie? God I hope not). I actually quite like those inferred interpretations of the character because they "make sense," at least to me. And that's why I really like this figure. That, and its sculptural perfection. What Alex Ross is to comic art, Tim Bruckner is to action figure sculpting – and the God of toys knocks yet another one out of the park. To date Bruckner remains the only person on the planet to be able to produce dead-on 3D renditions of Ross' art and Bizarro is no exception. The likeness is virtually perfect. 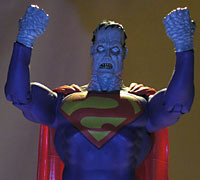 The figure is about 85% identical to the Superman figure (much like the first DCD Bizarro and even the new Mattel Bizarro). The only sculptural differences are the hands, the head, and the neck. While the torso appears to be one solid piece, there's actually a break at the neckline, allowing DCD to maximize its money by using the same large mold for the torso of both figures. 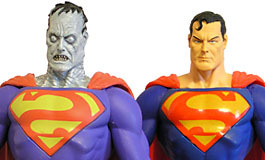 Other than that, the only other differences between the two figures are the costume coloring – Bizarro's colors are subtly muted shades as compared to rich shades used for Superman. Again, these aspects and ever so mild variance might bug us normally, but here I accept it because this isn't intended to be a generic Bizarro. It's meant to be Ross' Bizarro, and that's exactly what it is. Articulation is pretty ample too, at least for DCD. Bizarro has 11 points and to be perfectly honest, for me that's too much. 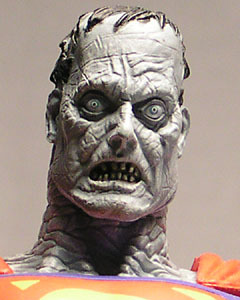 See, I love art, and that's literally what this sculpt is. I personally feel that the articulation detracts from the genius of Bruckner's skill and not only would I be happy with less, I would prefer the very limited articulation found on the Kingdom Come figures simply because those were designed to be unobtrusive and hidden on the sculpt [you're an idiot --ed.]. However, in today's action figure climate, it's virtual suicide to make sculpt paramount (unless it's McFarlane Toys, and look at the way they're grasping at straws now) so we got several joints on this figure. That said though, ultimately the articulation isn't that bad, it doesn't detract from the sculpt too much and is, in many ways, a kind of "happy medium" between sculpt-freaks like myself and articulation freaks spawned by Marvel Legends. I'm especially adorative (shut up! it's a word! on Bizarro World, at least) of the shoulders: the musculature blends very well, daresay seamlessly, and still allows for multiple posing options (a near essential for toys, I think we can all agree). Ultimately, this is truly a brilliant figure that offers an excellent sculpt! Granted, it's not for everyone as it is more of a non-traditionalist (at least by today's standards) interpretation, but I still highly recommend it. Now... if only we could get DCD to give us a classic, cubist Bizarro, I could probably die happy!